A hit! A direct HIT, by Charles! Have you come across any serious following through on this line of thinking? If so, please link it! Thank you, poet of the Golden Calf disclaimer. Dear incompletehistory–I already am very very angry about the environmental disasters en masse–the ones that have nothing to do with Mother Nature and Everything to do with Homo Sapiens at large. Surfactant is a very useful piece of knowledge. Thank you for bringing it to my attention. I bet you enjoy haggling in those marketplaces in Morocco. Yeah, I’m not really into bargaining to tell you the truth. I always feel like either I’m getting ripped off or the person selling the goods is getting ripped off. On a slightly unrelated note, I read this today and just about fell off my chair. Oh yeah–you just ‘almost’ fell? What are ‘they’ thinking? Yeah, Profit, Profit, Profit. But there will be no more PROFIT when we’re all choking to death, will there? Whacked–so very whacked! Thanks incompletehistory—hey, maybe that’s what our history will be as a species–‘incomplete’ because there will be no one left to write of our demise by our own hands? Is there an end in sight? I fear not. Great diagram Eva! 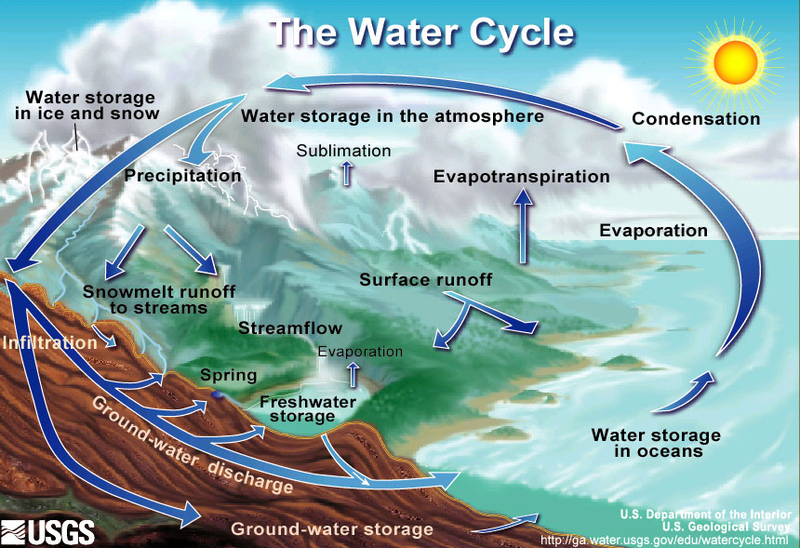 The water cycle is life on this planet. Because of climate change and the melting of polar ice, there is much more water and energy in play and we see the result in increased flooding world wide. Glad you like this diagram, Al. Took me a while to find one that showed what I was wanting. Ah yes, flooding AND how toxic chemicals are shared/spread via the water cycle. So much to look forward to. The other day i was thinking after lots of rain the flow of from roads all the petrol an other deposits on roads the rubbish all down the drain and than. Her we had an oil-spill the Sea-empress tanker and how many more do you know from around the world and how many more there still will come as we drill further and further. Clegyrboia–now that’s one hell of a horror story based on reality. I wonder what people would do IF they ever visited their local water/sewage treatment plants for their cities? If they don’t see it, smell it, know it then that part of our everyday existence apparently doesn’t ‘exist’ for most modern folks. Oh and do check out Magda’s moonponds too! Hope everyone enjoys the Banana Slugs–they’re something else!